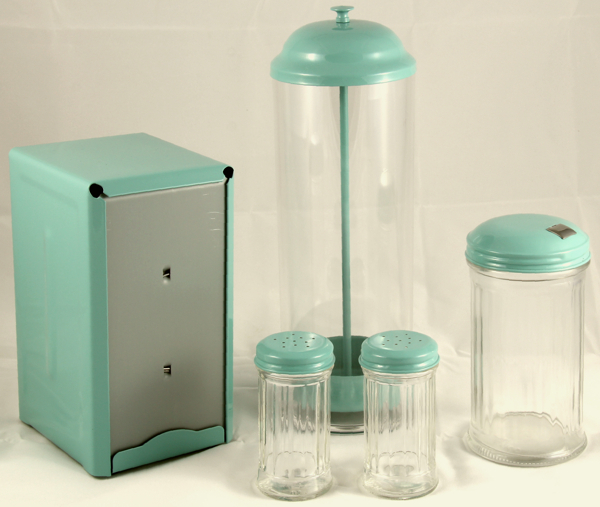 This Light Turquoise tall fold napkin dispenser is from our 1950's Retro Diner Tabletop collection. It is stainless steel with a beautiful gloss baked enamel finish. It is a double sided dispenser with spring loaded metal backing plates to ensure that napkins are always in reach. Overall dimensions are about 7 1/8" tall, 3 3/4" wide, and 4 1/2" deep. Use tall-fold napkins that are 3 3/8" x 6 3/8". 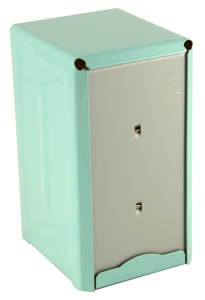 Click here for natural kraft napkins, or here for tall fold white napkins for this dispenser.